Media outlets across the globe are sending crews to border counties as the Brexit countdown continues. 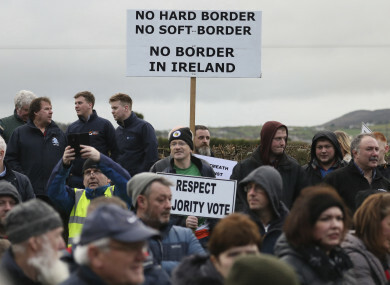 ANTI-BREXIT CAMPAIGNERS along the border have been dealing with a surge of interest in recent weeks as media outlets around the world dispatch crews and reporters to speak to locals on either side of the 500km boundary. TheJournal.ie spoke to local residents about their fears of a hard border at Dromintee GAA club in South Armagh on Wednesday night, alongside a reporter from a German daily newspaper and a camera crew from Reuters (you can read the full story here). Damien McGinty, a local organiser for Border Communities Against Brexit, said he’d arranged the event as a way of meeting all the media requests they’d been getting in the wake of Theresa May’s failure to get the EU-UK withdrawal agreement through the House of Commons last month. Fears of a no-deal exit increased further in recent weeks amid continuing disarray in London, leading to an inevitable rise in interest from news organisations in what’s likely to happen on 29 March, and what it might lead to. “It’s crazy,” McGinty, who runs a local post office and a small farm, said. Another organiser had met with reporters from Euronews earlier that day and was due to meet with a Spanish crew the next day. They’d also just finished their contributions to a documentary following the group to Strasbourg to lobby EU politicians, McGinty said. He’s not complaining, he emphasises – they have a serious message to get out, and it’s important to communicate it, particularly to Europe. Formed in the wake of the 2016 referendum vote, which saw a majority of voters in the North vote to Remain in the EU, campaigners from the group have lobbied extensively in Belfast, Brussels, Dublin and Westminster in recent years. They’ve also organised large-scale demonstrations and stunts to emphasise their message – including a protest two weeks ago that saw organisers build a wall and eight foot watchtower, manned by actors in military fatigues. In Clones, Co Monaghan, another stop on what has now become a ‘Brexit Camino’ for international reporters, local businessman Eamon Fitzpatrick told TheJournal.ie it was essential to get the anti-border message out. Fitzpatrick, whose fuel and hardware business on the outskirts of Clones is bisected by the border, had also hosted the Chinese media crew in recent weeks. Sinn Féin councillor for Clones Pat Treanor said locals hoped they were “doing a little good by getting the message out to MEPs in other countries and governments in other countries”. Email “'It's nuts': Crews from China, South Korea and Australia descend on border amid 'no-deal' fears ”. Feedback on “'It's nuts': Crews from China, South Korea and Australia descend on border amid 'no-deal' fears ”.